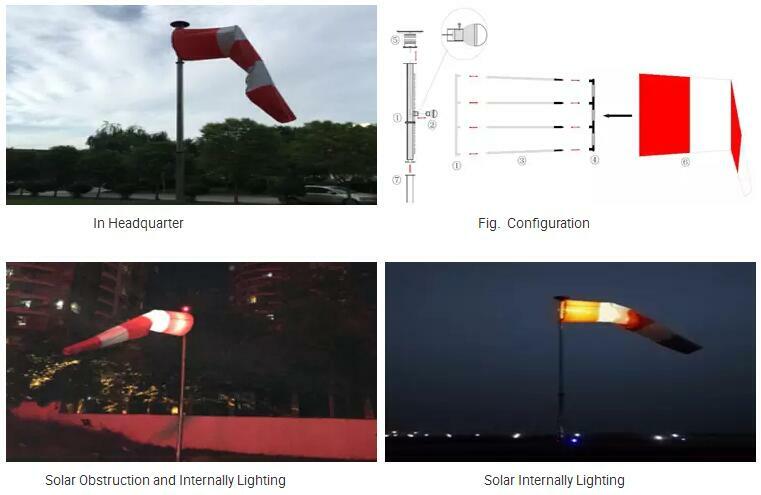 A Solar LED Windsock for Airport Helipad airport airfield is used to visually indicate the wind direction for Airports,helipads,Hospitals,Military Bases and Corporate Headquarters.The Wind direction In dicator DWS-WV-807 includes a 12-feet wind sock, a solar obstruction light and a solar internal floodlight. It complies with FAA AC 150/5345-27E. 12 feet(3.6 meters),Size 2 Red/White sock. Detachable stainless steel bracket for sock. The working mode is chosen by the remote controller. Lens is poly-carbonate with anti-UV which is produced by Bayer. Completely solar self-contained and waterproof IP65. 1.How to choose the working mode? The working mode of DWS-WV-807 is chosen by the remote controller that has four keys---1,2,3 and 4. When these night landing lights are needed,the mode has to be used. When there are not flying tasks at night,this working mode is the best choice. When the wind vane isn’t used for a long period,the mode should be chosen. Please note the remote controller has a switch on its side and turn off this switch after operated. 2. How to install the bracket of the windsock? Please note: Connecting ③ to ① and connecting③ to④ must be synchronized. Step 4: Insert the frame consisted of ①, ③ and ④ into ⑥, fasten with ropes. Step 5: Connect the assembly from step 1 to 4 with ⑦ using screws.Yes,you can easily turn off this lantern by a touch switch in the side of it.We also suggest that you turn off it when it isn’t used for a long time.So it is only charged during the day and discharged at night.